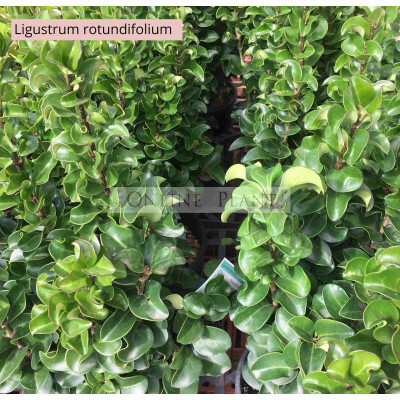 Ligustrum Rotundifolium Japanese Privet is compact shrub with thick, glossy, rounded wavy leaves. Makes an ideal specimen plant in containers and a thick heavy looking hedge. Its chunky appearance is real contrast in most garden settings. Terrific plant to consider for bordering driveways or paths. An abundance of cream flowers in summer followed by black berries. Plant in full sun or partial shade. 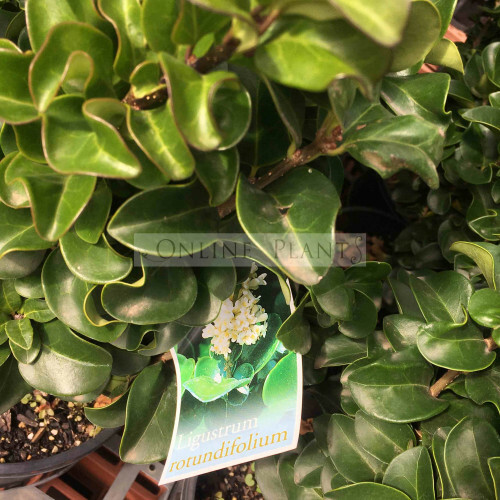 This is an Evergreen, hardy shrub tolerant of frosts and extended dry periods. At maturity will reach 1.5mt tall and 1mt wide, However Japanese Privet can be pruned much smaller than this if desired.